Beautiful townhome with 2-car garage and brand new, private hot tub. 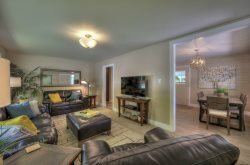 Enjoy your next vacation to Moab in this lovely Cottonwoods townhome. The perfect place to relax after a long day of enjoying the Moab scenery. Relax in the private hot tub while simultaneously taking in the stunning rim views through the giant cottonwood trees that tower over the back yard. Or if your in the mood for a swim, take a stroll to the indoor, year-round pool of the Cottonwoods complex. -After reserving, you will receive a confirmation and rental agreement via email. The rental agreement needs to be signed and returned to receive your welcome kit with check in instructions 14 days prior to arrival.